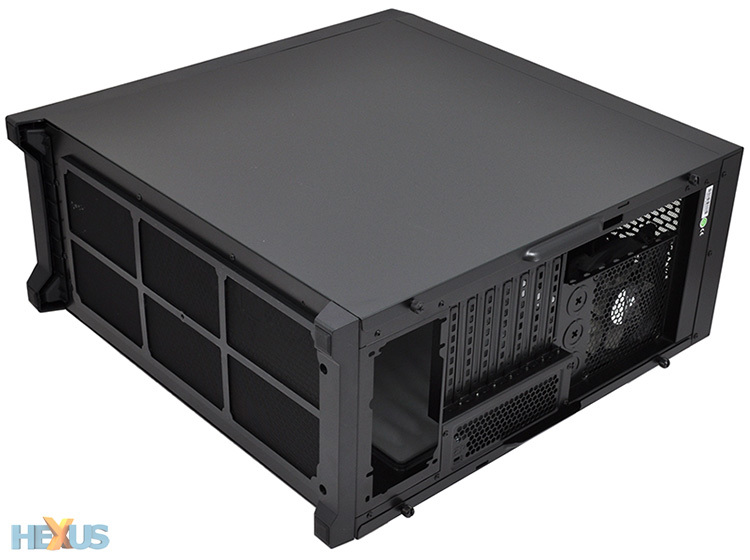 Remember when Corsair's Obsidian was the go-to chassis for builders looking to put together a high-end rig in a big, premium enclosure? That was the Obsidian's raison d'etre, but since the award-winning 800D's inception, the market has shifted dramatically. There is less demand for giant full-tower boxes, older components such as optical drives and hard disks appear to be on the way out, and smaller enclosures are all the rage. Meeting this change head on, Corsair has thoroughly revamped the Obsidian line with the launch of half-a-dozen models designed to service unique segments of the market. The range-topping 900D is the current flagship, there's a cheaper full-tower in the form of the 750D, a sound-proofed 550D designed specifically for the quiet-computing crowd, a Micro-ATX 350D, and a Mini-ITX 250D. There's an Obsidian for almost everyone, it seems, but there's an obvious gap between all those models that Corsair is now plugging with the launch of the mid-tower Obsidian Series 450D. Mid-tower and Obsidian sounds a familiar combination, and so it should, as Corsair did something similar a few years back with the mighty-attractive 650D. However, with a price tag of £140, the 650D is a remnant of the pricey Obsidian product line of old. Trimming away the excess, the 450D goes without niceties such as an integrated fan controller, quick-release side panels and hot-swap SATA bays in order to deliver a mid-tower Obsidian at a more tempting £90 price point. A lower price tag is always welcome, and yet Corsair has made sure the new addition remains easy on the eye. In keeping with all of its siblings, the 450D comes only in black and has the clean, well-defined lines we've come to expect from an Obsidian Series enclosure. At first glance, this looks a lot like a scaled-up version of the Micro-ATX 350D. That's true, for the most part, though there are some subtle changes to the exterior. The fan mounts up top have been lined with a magnetic filter that fits really well (it actually looks as though it is part of the chassis itself) and the front now carries a mesh filter, too. The floating brushed-aluminium panels that define the new Obsidian look are still present, but the large pop-out panel covering the front intakes now features a mesh section that does two things; firstly, it improves airflow; and secondly, it inadvertently spoils the the otherwise clean aesthetic. That's a price Corsair was willing to pay in order to bolster performance. Measuring 494mm x 210mm x 497mm in size, this is a mid-tower of modest stature and all the exterior additions you'd expect as standard are present and accounted for. 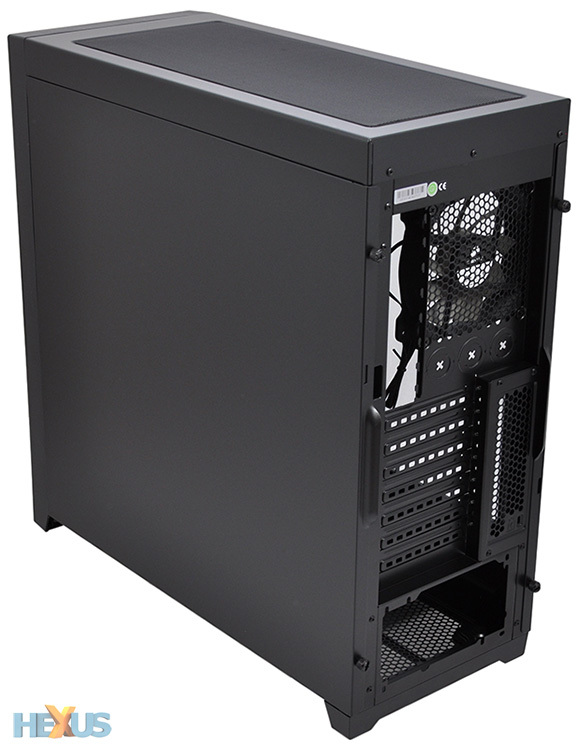 These include a full-size magnetic filter lining the bottom of the chassis, and a front I/O panel carrying the same functionality as the 350D, meaning headset and microphone jacks, power and reset buttons and two USB 3.0 ports. Corsair's steel frame feels nice and sturdy, overall build quality is good, and from an aesthetic point of view, the 450D is going to appeal to consumers who prefer a sleek, streamlined enclosure. There are no other colour options, no gaudy LEDs, and if you've got components worth showing off, you'll enjoy the windowed side panel: it's slightly tinted and looks the part. From the outside, the 450D is a traditional mid-tower enclosure that is smart in appearance, geared for performance and able to offer Obsidian Series build-quality for under £100. However, in order to stand out from the crowd the 450D needs to have a stellar interior, so let's open it up and take a look.